The new vented version of the standard Uniko handguard. Characterized by a particularly lightweight and resistant nylon dual injection frame. Comes complete with a universal mounting kit. Bought theses for my YZ250F 2012. The fit perfect, look great, the price is quite good considering other guards prices, and they seem that will hold on quite well as they are very flexible. I don't think they will break that easily. Mounts on this model are better than others. Layed the bike over a few times and they haven’t broke yet. Highly recommend them and a perfect price point. Look great, durable, only the best from acerbis! Great quality, helps a ton. Big difference in how I can ride in the woods, nothing catches my hands anymore, I could practically ride without gloves. Installation is easy, but a pain if you have a lot of stuff on your bars! I had cycra probends on the bike but I just didn't like them. Installed these to still protect my fingers from a bit of wind, roost and twigs and they get he job done. Order and received these about a week ago. Haven't had the chance to ride with them yet but they look great on the bike and were pretty easy to install. It super straight forward with only two bolts on each side, but I did find an extra set of hands to be helpful for holding it in place while I tightened it all down. At first I did not think the mounting arm was going to fit around my handle bars, but as you tighten the Allen key it form the mount into shape to hold tight. They feel pretty durable although I would not purchase them if you are looking for more of a bark buster as these will likely break if they take a hard hit into a tree or something of the such. Great looking as I said before, and look forward to putting them to use. good guards for the money. you dont want to fall with them. These handgaurds are great I would purchase them again. If you are looking for hand protection, but arent worried about smaching into trees very often, then these are great handguards. They clock the roost and do their job. A well placed rock off of a rear tire can and will crack the "mesh" looking plastic on top of the handguard, but other than that there really is no downside at all when buying these hand guards. I do wish that Acerbis would go away from using allen head screws for installation though. I really liked the fact these come in a variety of colors to suit any brand. The over the bar mount is nice, I found that I had to flip the mounts and guards to fit with grips and bars. But the fact you can do that is amazing. Nice fitting, mounts run over the top of your levers. Has some adjustability. I purchased these knowing they are more for looks than durability and thought they would compliment my WR 250 R Supermoto conversion. They are made to fit the standard 7/8 bar and they do but between the mirrors and signal/light unit there is no way to mount these. Bummer! 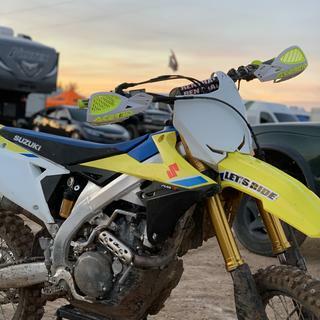 I bought these handguards awhile ago, they look good on the bike but my only issue is that they are not durable nor sturdy. i will be replacing this product to wrap-around handguards. ive spent a lot in broken brake levers already. 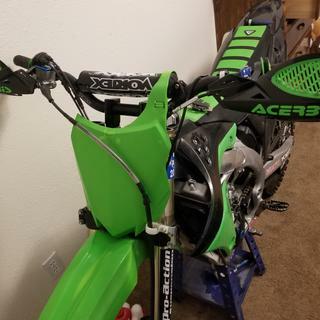 Fit my son's KX85 great with no issues. These look pretty sweet. I ordered the black with green writing on them and they definitely made my 2002 KX250 look amazing! Now here’s the problem... if you like how your bike looks with them on, do not take it out of the garage if there’s any chance you could hit anything. I did get about 30 minutes of trail time before I lost the first one. I actually hit scrubbed a tree yesterday during a trail ride and the only thing I noticed was the hand guard being turned up some. I do suspect that a harder hit would break the guard due to the plastic frame material. They look decent too.. They look amazing but for real woods I recommend the tusk wrap around kit to better protect your self. If you do have these take a zip tie and secure the inner part to the bars to make it outside covering the grips not fold as easy. This makes it much more secure. keeps small brush from getting your fingers. these work ok for keeping little stuff from whacking your hands. they wont protect you or the levers much from anything substantial. they look good and are cheap so i like them. better than nothing and you wont break arms if you go over the bars like if you had bark busters. they have survived a few falls but have some stress markings from the plastic bending. Put these guards on my Suzuki, found that they were easy to install and look good. I feel that the plastic mounts are the weak point. Mine are still intact but I suspect a good tree hit on some single track wood trails would break a mount. The guard itself is quite flexible and looks designed to take abuse. Can't say much. these hand guards helpful, reasonable, easy to install and look good! I like the hand guards they look good put on easy and do the job well. Good product, easy universal mounting brackets. Colour matches my bike perfectly. 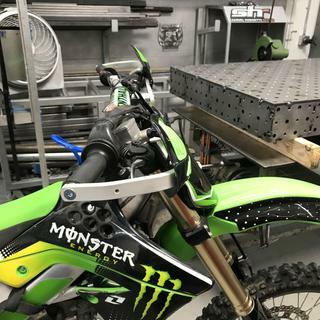 The handguards mounted with little effort, although you must move your clutch handle and kill switch inward in order to have room to mount the guard on the left side. Look good mounted for the money. Average rating on durablitiy and protection, more to say about that after some abuse on the track and trails. They're nice, add a cool look to the bike. Very cheaply made though, can almost guarantee they'll break first time I lay the bike down. Pretty easy to install but arent adjustable so you have to move your levers to make them work. Probably won't deflect much more than some roost either. Probably end up goin without after these break but we'll see. On my second set, these add a great balance between cost and protection while adding eye appeal to any bike. Though not true bark busters they protect from flying debris and small branches with ease. Acerbis Uniko no adjustability and pretty "cheesey"
I would not recommend these and was very disappointed in fitment options for any of our bikes. Not a well thought through product. But now we know. Great product fits great on my son's ktm 50 and not too oversized which is what I was nervous about. Would definitely recommend for any bike for the price. Great hand guard I have raced three years with my old set and they lasted alot of flips. 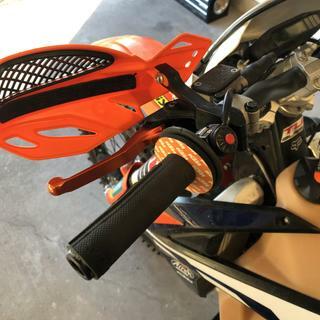 Great alternative to the stock ktm brush guards. Good look and low price. 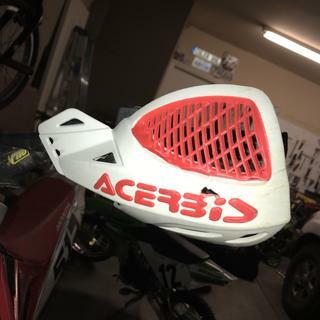 The Acerbis hand guards are very effective for casual trail riding. They were easy to install and look great. I can't say anything about the handguards themselves, because there was no way to install them. Probably my fault for not verifying that they work work on the Freerides with electric start. Im sure they are decent handguards but I couldnt get them to fit without changing my whole setup. Inexpensive and work great, didn’t think I was into hand guards till I put some on, now I’m sold on or off the track. Some damage from a crash, still doing its job. For the money, these are a pretty good buy. Enjoying the look and they seem durable. Also love the many different color combinations to choose from. Easy install on and off since I only use when conditions warrant some roost or tall weed/cactus protection. not susceptible to breaking as easy as others i have used. I’ve purchased these for two bikes now and not only do they look great,they hold up great. I’ve dropped bikes many times with them on and they don’t break. Easy fitment. Very durable. My kids on 50s use them, and they have survived many crashes. Look good, lite, and tough. I've had them in the dirt a few times and they are still holding up. Fits nice on a Ktm 65 with micro bars. Taken some crashes without braking. Overall a good product. Do they come with the clamps? BEST ANSWER: Yes, they do come with the clamps. Yes, they come with a set of plastic mounts that are very durable and everything else needed for installation. I've given mine a fair share of abuse and are still holding strong.???? Yes everything you need to mount comes with they are very flexible and durable. Yes they do! Everything necessary to mount the guard to your handlebars! They do come with the clamps, everything you need to install and ride. Yes they do. Everything needed to install besides the Allen head. Yes they come with clamps that attach to the handlebars. Would theses be able to mount on protaper fat bars? BEST ANSWER: Yes you can. They will fit on all bars. Yes they are designed to fit all bars. Does the black and orange have a matte finish or a "gloss" finish? They came with all the hardware that you will need. I think these hand guards are one of the best out there. A little advice though- I did not tighten them tight. I have hit the ground a couple times. They still haven't broke yet. They just turn on the bars. Yes they do. Plastic mounts. I believe aluminum mounts are available but not necessary for moto, which is what these guards are designed for. Yes! When I got mine they came with everything you need to get them in my bike. Yes all hardware and mounts are included. What bike does this go to? 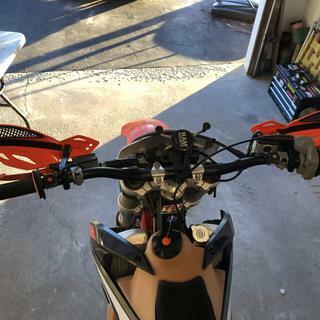 THEY CAN FIT ANY HANDLEBAR, I USE THEM ON A HONDA CRF 250X, RENTAL HANDLEBAR. 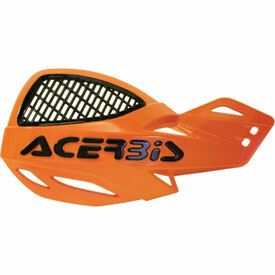 These hand guards will fit on any motorcycle or ATV. They are universal. These hanguards are universal and mount to 7/8 bars. I love my set. These Mc guards will fit multiple different bike. They fit all bikes even minis. will they fit my 2017 Husky 501 fe ? BEST ANSWER: I don't see why not?! They have universal mounting hardware. Although I am not 100% sure, I don't think there should be a problem though. Depends on what your bar size is but I believe they are universal hope that helps. Yes I put a set on a 2017 husky Tc 250. Do these work on a crf150f? BEST ANSWER: I'm sure as they are all pretty much the same. I would recommend them..great buy and very durable !! Do they come with mounts. If so. Are they strongoing full wrap around ones? Or just halfway? Yes they do have them on a 2005.
yes. they will work fine!!!!! Will these fit only fit on stock bars?? BEST ANSWER: These will fit on any handle bar but come with cheap mounts. They will work to keep rocks from hitting your hands but will likely break during a crash. I drilled holes in them an mounted them to cycra probend bark busters. 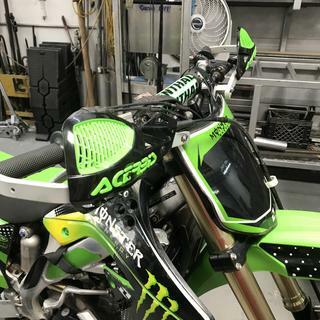 Where all MX type hand guards are mounted they are 7/8 at that point. The fat bars and twin wall bars all taper down to 7/8 at the handlebar controls. They will fit 7/8" bars and 1-1/8" bars. Fat bars are the same diameter as standard bars where everything mounts up. No they will fit on any bars. I have a set on my protaper fuzions and they fit fine. Are they soft and plyable. NOT HARD AND BRITTLE? BEST ANSWER: I’ve had good luck with them. But i have had them break before. They are a hard plastic but do give a little. pretty soft, they will not protect your levers. Will it fit 2015 KTM exc-f 350? I use them on my KTM 250sx and love them I also had them on my 2013 KTM450SXF and they worked great on that bike too. Yes. They are universal. They will fit any bike. Will these fit 2017 Honda CRF230F? BEST ANSWER: They will defiantly fit that bike. I have had them on my past three bikes and they are awesome. Worth the money they protect your hands great, and are extremely durable. Very worth the money!!! Yes they will it doesn't really matter the bike year it just matters in your handle bar width. Yes these should fit. They have universal mount. Will fit any 7/8" bar. 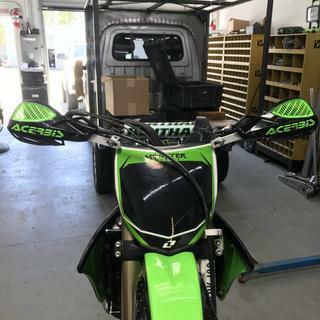 Will these handguards fit on my 2010 kx450f? BEST ANSWER: Yes, I believe they will fit your KX450F as long as the handlebar and controls are all stock. Yes, minor adjustments to the levers may be needed. Yes,they will fit.Have a pair myself,nice guards! WIll the fit good on my 2017 yz450f? BEST ANSWER: They work well on all the bikes I have tried them on. CRF150R, YZ125, YZ250. The only issue I had was on the little bike we had to rearrange the kill switch to allow room for the mounting but that bike has a hot start in the way also. 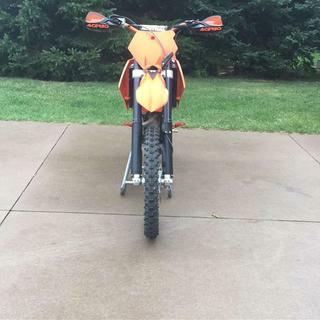 Sorry but I don't know I ordered for a ktm 50sx, but what I can tell you is how awesome they are they are really good looking and durable. Hope that help. I have them on my 2015 KTM 250 SX and they fit great! I cant see why they would not fit just as well on your bike. Yes these are some of the best fitting hand guards on the market. How well will these protect my levers? BEST ANSWER: Only slightly, these seem to help more for branches and shrubs that pop out on the trail. Also they really help keep roost off your knuckles if you are following someone. If you want something to protect your levers get bark busters with the metal reinforcements. nope, i broke my brake lever twice. Will these fit on a KTM 50 sx pro senior?? BEST ANSWER: Yes They fit on my sons 2002 50 Sx pro Senior with pro taper bars. Hey does this fit a 2017 Honda CRf 125 FB??? BEST ANSWER: It should fit any handlebars as long as there is room to put the bracket on. For example, my Honda 450X has so many things on the handlebar ends (Clutch, kill switch, on the left side and the front break and electric start on the right. I know I'm leaving something out) that I barely had room to install them. will they fit on a 2018 kawaski klx140g? They are universal. I would assume they would fit!? 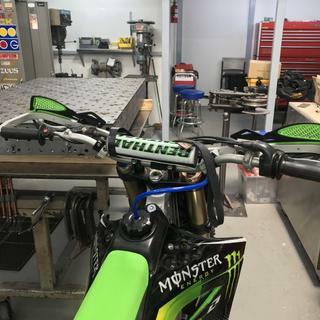 Will they work on my 2010 kx450f if it has ODI lock-on grips? BEST ANSWER: I bought them for my 2012 KTM 350-xcf, The guard doesn't attach to the grip at all so I cant see why it would be an issue. My boys have those grips on their bike and they have a similar guard and it fits fine. Yeah, I cant see why they wouldn't. Will these fit 1 1/8 handle bars? Do you sell replacement shields ? will they fit my 2015 KTM 350 exc-f? Will this fit a 1998 kdx 200? BEST ANSWER: Yes these bolt onto any 7/8 handlebar. will these fit for my 03 yz 85? BEST ANSWER: Yes they will fit perfectly. 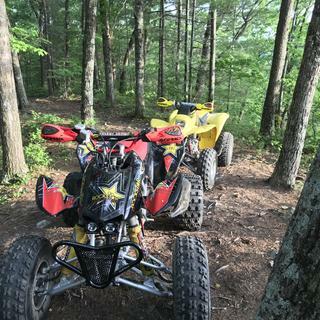 Do these fit 2016 Yamaha YFZ450R with the hardware you sell with them? If so, are there any install videos? BEST ANSWER: They fit most all MX bikes, sorry they were not designed to work with quads. The levers on ATV's are so long they hit the hand guards. You would have to change your entire handlebar set up to be similar like an MX bike to run these hand guards. BEST ANSWER: We do not sell just the replacement shields for these guards. You would need to purchase the full kit again to get the shields. Will this work on a CRF150f 2006? BEST ANSWER: Yes, they can fit on that bike.